My grandma makes the absolute best chicken salad; it’s one of my favorite things to eat when I visit her house. 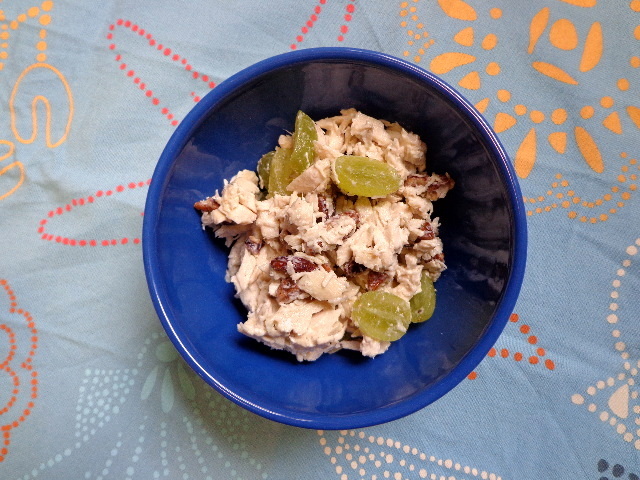 Her chicken salad is juicy without being too loaded down with mayo, and the grapes add the perfect amount of sweetness to offset the toasty pecans. She swears she just throws things together, but I modeled this recipe after my memories. Shred chicken by hand (using a food processor will yield pieces that are too small and your salad will feel homogenous instead of a bit chunky) into a large bowl. Add all remaining ingredients except for grapes and stir until well combined.